This piece took several months because I was finding a way to make flowers look like a spinal cord. 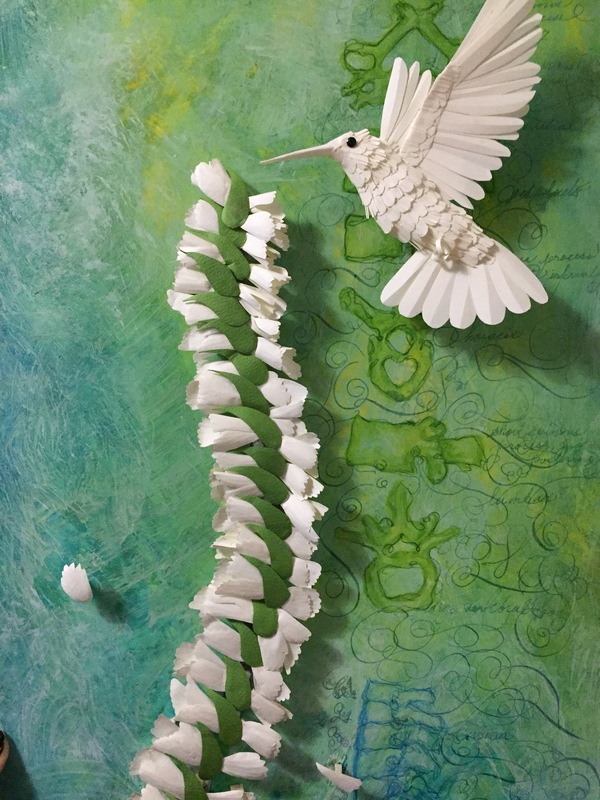 I drew the background first and then I mounted the paper flowers and the little hummingbird. There is a lot of similarities in nature and I want to say we’re all very much alike: flowers, plants, non-human animals, humans, and the patterns in nature. I’m also doing what I should have done a while ago- making something about my father. Yes, he made a lot of big mistakes and I was too little to understand, but I held the resentment in my heart until it was maybe too late. He was a doctor working in emergency medicine and he lived miles away from me. One day he just suddenly died of an AAA (abdominal aortic aneurysm) rupture and I never got the chance to say: “dad, we’re okay”. Sadly, I understood too late that having him close, and forgiving, would have been good for both of us. Sure, what happened was ugly and I still have issues about it, but people can change for the better. Many things could have healed the wounds besides time – it took so long for me to understand… and now, at this moment in my life, I would have liked to be able to talk to him as a friend and ask for advice… something I never had from him. We all make big mistakes and the lesson is to forgive and understand, because our lives are short and we never know when will be the last time we see the people who are important to us.